The pleura is the membrane that envelopes the lungs. This is kept moist with a small amount of slippery fluid, called pleural fluid, which is produced by pleural cells. This allows for a smooth movements of the lungs against the pleural lining of the chest wall with every breath we take and this should be entirely pain free. Most people are not aware of breathing. However, there are many conditions where this is not so. When there is an inflammation of the pleura (= pleuritis) from an infection or from trauma, there can be scarring and the two opposing layers of pleura can stick together or rub on the scar tissue area. This can cause pain. It can also cause fluid production and such an accumulation of fluid in the chest cavity is called “pleural effusion”. This condition is often associated with childhood tuberculosis , with fungal lung infections, pulmonary embolism or a malignant mesothelioma (thanks to www.mesothelioma-cancer-treatment.com for this link) due to asbestosis etc. A pleural effusion (thanks to emedicine.medscape.com for this link) is not always symptomatic in the beginning, but when it causes shortness of breath due to an inability of the lungs to expand, it leads to shortness of breath and pressure with breathing. If there is a lot of inflammation due to mechanism of the underlying disease process, there can be pain with every breath the patient takes. 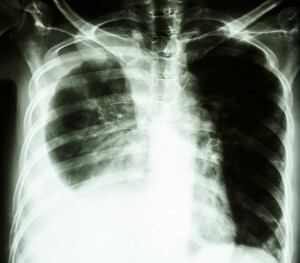 As the link above shows, there can be a myriad of clinical conditions that can cause a pleural effusion from congestive heart failure to rheumatic illnesses (lupus, rheumatoid disease), from mesothelioma and asbestosis to Hodgkins lymphoma and metastases to the pleural cavity from other cancers. This list is incomplete. However, it shows that the underlying disease process, of which a pleural effusion is only a part of, will determine the other symptoms. The treating physician must have an investigative mind and order appropriate tests. Often it takes a referral of the patient to a lung specialist who will arrange the tests to come to the right diagnosis. There are a number of diagnostic tests for pleural disease that are available and will help the physician to narrow in the diagnostic possibilities. Chest X-rays and CT scan usually can identify that there is a pleural effusion present. Further tests such as ultrasound investigations can distinguish between solid or liquid phases and show whether or not the effusion is divided into several chambers (loculated). 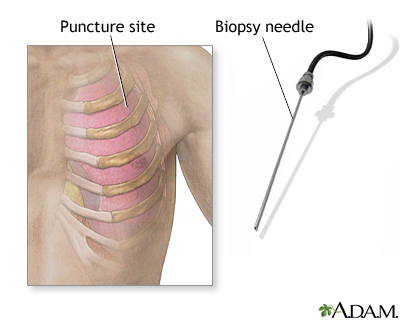 With thoracentesis (thanks to nursingcrib.com for image) a needle is introduced into the pleural space where the bulk of the effusion is; this can be accurately done when ultrasound guidance is used to place the needle exactly into the center of the bulk of the pleural fluid. The pleural fluid that has been obtained is sent to the laboratory and various tests are performed with it including a chemical analysis and cell analysis. A thoracoscopic pleural biopsy (thanks to www.nlm.nih.gov for this image) is the most direct approach to get a small, but typical biopsy sample for histological analysis. The treatment will depend on the cause of the pleural disease. The principles outlined here are identical for adult patients and children as well. Asbestosis related disease can be managed, but not necessarily be cured. Here is a site that deals with asbestos related disease. (thanks to www.asbestosnetwork.com for this link). Malignant mesothelioma associated with asbestos exposure is a difficult to treat malignancy. However, here are some links to mesothelioma treatment literature. (thanks to www.mesothelioma.com for this link). Infections such as pneumonia are treated with antibiotics. Tuberculosis or fungal infections are treated with the appropriate combinations of antituberculous or antifungal antibiotics. SLE(=lupus) and rheumatoid disease is treated by the rheumatologist and the combination therapy may have to be stepped up to get the disease process under control. Congestive heart failure is being treated by the cardiologist depending on the underlying cause.